Happy Hamby Campers: Growing boy's breakfast! We slept very well on Friday night, after our fossicking exertions! (Vaughan stayed asleep while the rest of us got ready for the day). 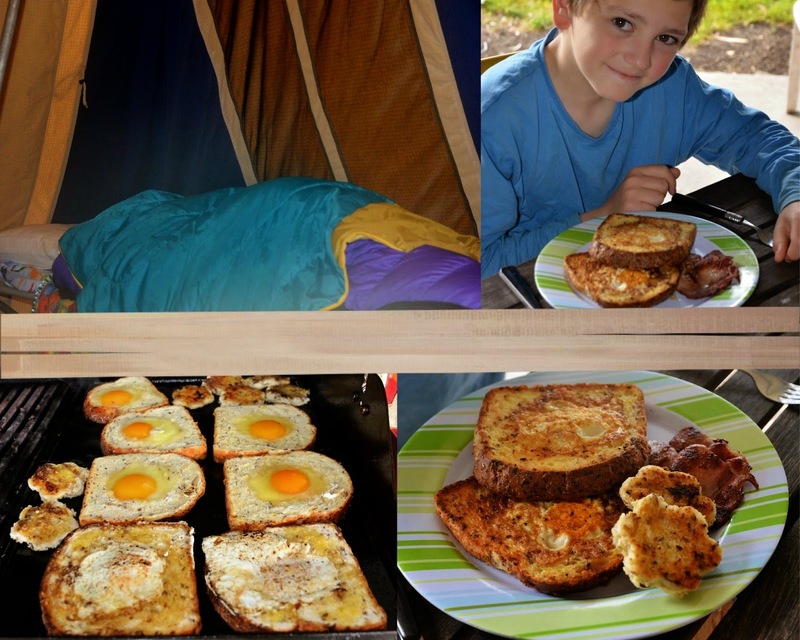 Eggs in bread feature regularly on my camping menu plans - and this trip we took eggs, gifted by our chookies! As Vaughan was still in bed, Erin was recruited as my assistant chef. She buttered one side of all the bread slices (including the flower-shaped hats). I cooked some bacon first and then put the bread on the BBQ plate. Nick worked with me to crack the eggs - and I sprayed the tops lightly with olive oil before flipping. Vaughan was finally lured from the tent by the promise of bacon. He glanced at his plate and immediately commented that I'd forgotten to include his hats! Once that oversight was remedied, he was very impressed by the new-style flower shapes. During a 4WD Action DVD cooking segment, we'd seen Roothy sprinkle the slices with either Worcestershire or soy sauce - but no-one could remember exactly what he used so we'll try that another time, after revising the method!